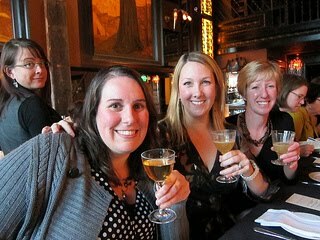 All our LUPEC meeting venues welcome us graciously, but LUPEC ladies who walked in the door of Bastille’s Back Bar for our April meeting may have felt a little extra special. It was a delightful surprise to see three large tables decked out with black tablecloths, cloth napkins, cocktail plates, drink and dinner menus, and (the always important) water glasses. 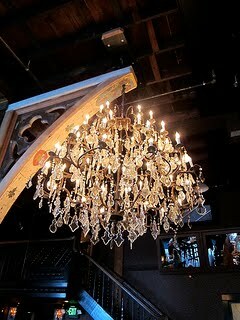 But maybe I should have expected that from a bar with a gigantic Illuminated chandelier as its central decoration. I was immediately drawn to the two barrel aged cocktails featured on the menu: Barrel Aged Primrose Hill Cocktail (gin, dry vermouth, maraschino, fernet branca) and the Barrel Aged White Point (white dog whiskey, punt e mes, yellow chartreuse, angostura & orange bitters). I have been reading about barrel aged cocktails, even seen a few featured in online cocktail menus, but thus far, hadn’t had the chance to try one. Always a sucker for Punt e Mes and generally preferring whiskey over gin, I selected the White Point. 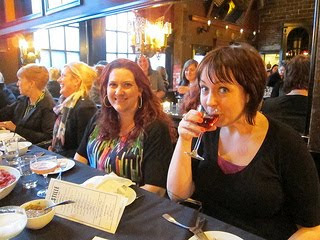 In traditional LUPEC manner, my cocktail was passed around for tasting by the ladies at my end of the table. I am happy to report that even those that aren’t white dog fans agreed it was very tasty, and a few ordered the White Point for themselves. 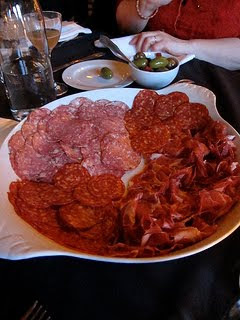 By the next round of drinks large platters of cured meats, bowls of olives, crostini and mustard arrived to help sustain us through the lively evening. Throughout the evening I had the delightful opportunity to taste several cocktails from the menu, including: Bankhead Cocktail, Saint-Marc Daiquiri, and Trinidad Buck. However, my favorite was the Pinfire Cocktail—basically a double old fashioned, but with some house coffee bitters and one of Bar Manager, Erik Carlson’s signature hand-chipped ice cubes. It was an appealing presentation, lovely flavor, and a smooth coffee finish that I didn’t expect, but was truly delightful. I was so pleased with this drink that I am determined to make some coffee bitters for my next liquor project. Some other LUPEC members chose to let our bartenders get creative, so I got to taste some funky rhum agricole-based drinks as well. I will definitely be expanding my rum horizons and the number of rums in my liquor cabinet as a result. I can taste at least three cocktails before ordering my own. Everyone understands eye contact with them may be sketchy until you place your first drink order. Having a passion for trying new drinks and owning more than five types of sweet vermouth is not viewed as a “problem”. I go to bars I never would have gone to and taste drinks I never would have ordered on my own. The more meetings I go to, the more welcome hugs I get from the fabulous ladies I get to know better every month. As you know, LUPEC isn't just about lovely gatherings and well made cocktails. We are also an organization that nationwide strives to help our communities by getting involved in charitable organizations and events. Sometimes we hold them ourselves. This time we got involved in the Eat.Run.Hope Food and 5K put on by Ethan and Angela Stowell to benefit the Fetal Hope Foundation. What a great event this was! A clear and crisp morning was perfect for the 5K (we walked) around Seward Park. Good thing we worked up an appetite because there was a whole tent full of delicious food from area restaurants to be had after! 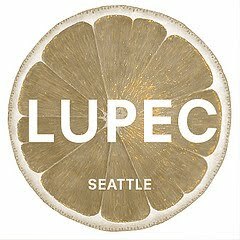 LUPEC Seattle had a goal of $500 to raise for the cause and as of today (donations have still been coming in!) we've raised $1,825!!!! I couldn't be more proud! I want to thank the ladies who walked (and ran) with me: Sonja G, Danielle F, Jan L, Tracy M, Stevi D.
I also want to give a special shout out to Stevi and Tracy who went above and beyond and raised money on behalf of the cause. And of course all of the ladies who donated to help us reach our goal: Danielle F, Jan L, Jen B, Lynn & Chelley, Carolyn R, Elisabeth K, Katarina K, Brook H, Lauren E, Sonja G, Elaine S, Leslie S, Valentina V, Leslie D, Sandra S, Julie B. And of course thank you to those who aren't a member of LUPEC but who supported us with donations also! We'll be doing this again next year!